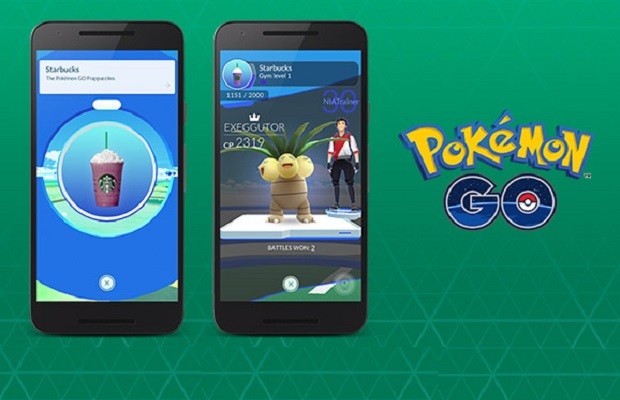 Entries from Digital Intelligence tagged with "nintendo"
Games developer Niantic has updated its Pokémon Go app, as the augmented-reality game's popularity has slumped from its record-breaking uswer numbers back in June. Pokemon Go! is starting to invade the workplace, with 53% of UK employees who play Pokemon Go admitting to doing so during working hours. Pokemon Go! launches in UK: How can brands catch the craze? 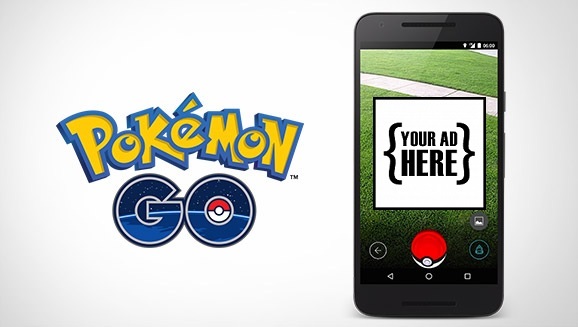 Pokemon Go, the hugely popular augmented reality game has finally launched in the UK. But how can brands capitalise on the latest mobile craze? Nintendo has announced its first smartphone 'game', but delayed its launch from the end of the year until next March. In a major move for gaming fans, Nintendo is working with Japanese developer DeNA to develop new games for smartphones. Popular YouTube content creator PewDiePie has criticised Nintendo for its plan to take a cut of advertising revenue from "let's play" videos featuring its games. Nintendo is get a share of the YouTube ad revenues from user generated videos featuring its games, sparking complaints from some of its fans. Nintendo has made its Miiverse social network accessible to all, letting non-Wii U users see the games giant’s first foray into social media outside of its console ecosystem. Sony’s upcoming PlayStation 4 console could play games streamed over the Internet using Gaikai technology, as well as traditional optical disc-based games, according to a news report. YouTube has launched a Wii U compatible version of its video sharing site, as the Google-owned service looks to expand its use among gamers. The new app uses the Wii U GamePad as a remote keyboard for searching through content on the site, with playback in up to 1080p Full HD. Microsoft is reportedly testing a version of its upcoming Internet Explorer 9 browser for its Xbox 360 games console. Sources speaking to technology blog The Verge understand the software would be compatible with the Kinect system, meaning users could browse the web using hand gestures rather than mouse cursors or touch screen devices. Nintendo has announced Nintendo Network, an online service that will span the Wii U and Nintendo 3DS, providing personal user accounts and the ability to purchase downloadable content. Nintendo knows it must take a “bold attempt” in establishing a robust online ecosystem for Wii U, and simplifying DLC shopping is key to that plan, the company’s president has said. Sales of online games are expected to pass physical retail from 2013, according to a new study. The report, from DFC Intelligence, predicts that online sales will increase from $19.3 billion in 2010 to $37.9 billion by 2016, driving the overall industry value to $81 billion. It also states that traditional retail have ‘peaked’, and will drop to $43 billion in 2016, down from a high of $58 billion in 2008. 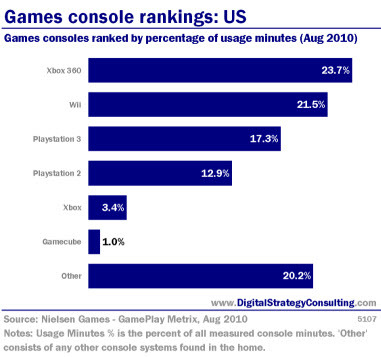 Games consoles ranked by percentage of usage minutes (Aug 2010). The BBC is to make its iPlayer catch-up service available through the Nintendo Wii, writes Brand Republic. This will bring the iPlayer directly to the televisions of the UK's 2.4m Wii owners. iPlayer usage has grown 25% each month during its first-quarter and 42m shows have now been accessed on demand since its launch on Christmas Day. The list of most popular shows includes 'The Apprentice', 'Gavin and Stacey', 'Ashes to Ashes', 'EastEnders' and 'Torchwood'.